3rd and 4th graders will be writing more and more book reports in the coming years. Help them perfect their book report writing skills with this simple English writing practice worksheet. With this worksheet, students will get practice writing objectively as they describe the setting, characters and events of the story. They will also write subjectively to narrate their own reaction to the story. 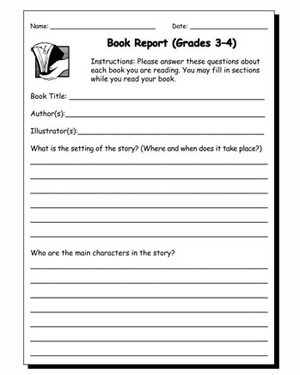 Have 8 and 9 year olds fill in a copy of this worksheet for every book they read, and soon they’ll be able to write book reports in their sleep!